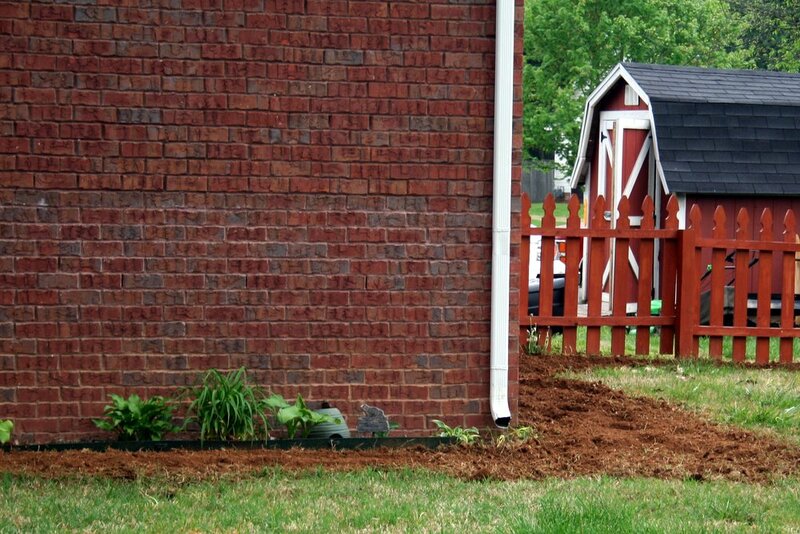 New landscaping beds come with lessons to be learned. Or relearned…because some things I should already know. So what lessons can we learn from all this? Delayed gratification. Landscaping is not completed in 30 minutes, no matter what impression you may have gathered from watching a gardening show. 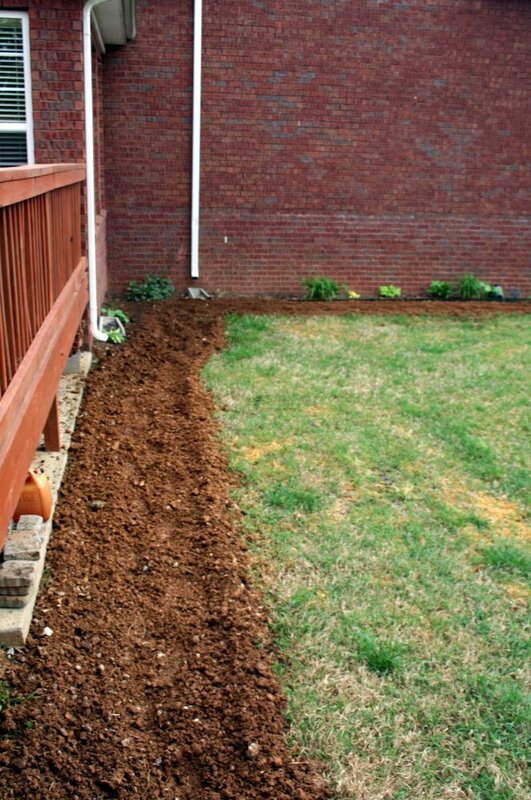 In fact, most landscaping projects won’t be completed in a day or even in a long weekend of planting. Learn to accept that landscaping projects take time – weeks, months, even years – to reach their full potential. While these areas are starting to settle in and look like they belong, it will be several more seasons before the plants grow to fill in their space. Amend, amend, amend. Can I get an amen? Our soil is clay, which is just as difficult as too-sandy soil. If you were blessed with naturally loamy soil, be grateful and don’t gloat. Regardless of your soil type, it needs a diet of healthy food and fiber to stay in peak condition. Yes, fiber: mulch, manure, compost, pine fines, etc.. They nourish your soil, but they are organic and will decay over time. Humans and animals don’t eat just once and then never again, do we? Your soil needs to eat, too. 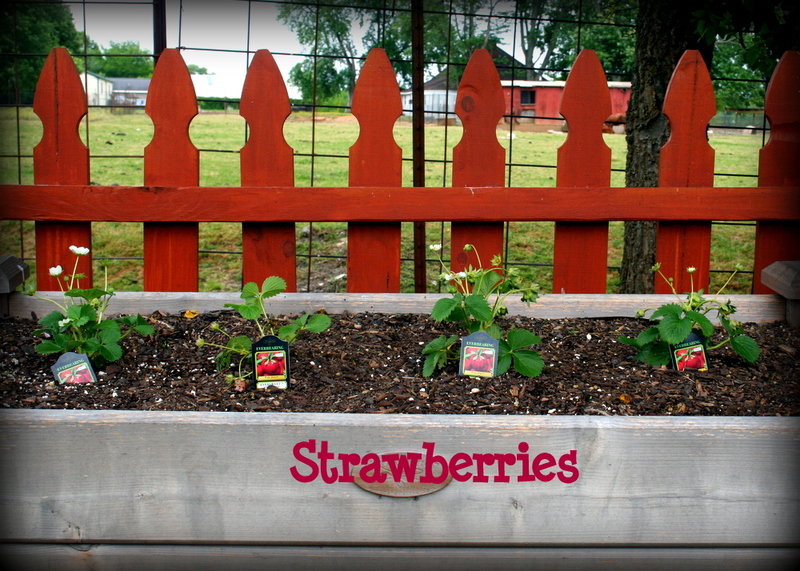 Feed your soil and your soil will feed your plants. In matters of transplants, size matters. Sometimes smaller IS better. 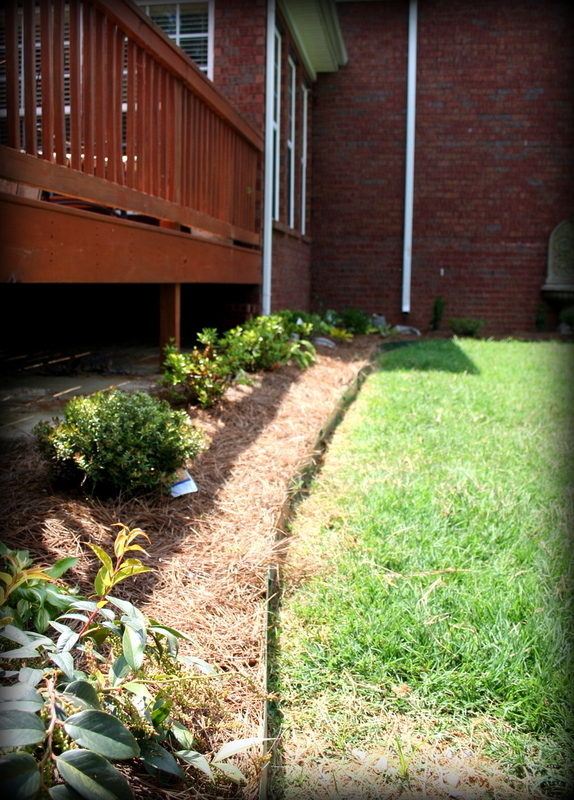 Smaller shrubs are younger and therefore cheaper. 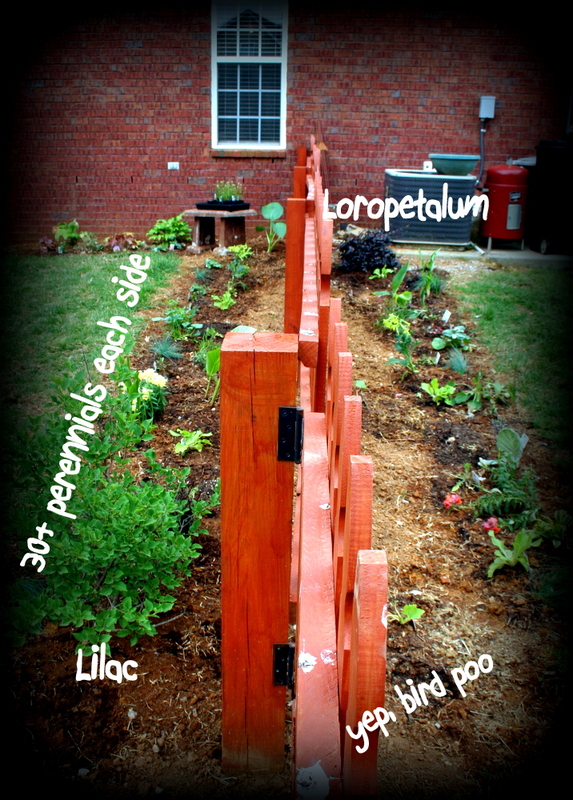 But beyond the dollars and cents, smaller perennials are generally more adaptable to new surroundings. With a little encouragement, they will settle in and grow better than older plants who may resent being moved. Spend the money you saved on amendments. See point #2 – you can never have too much soil amendment material. They look out of scale! 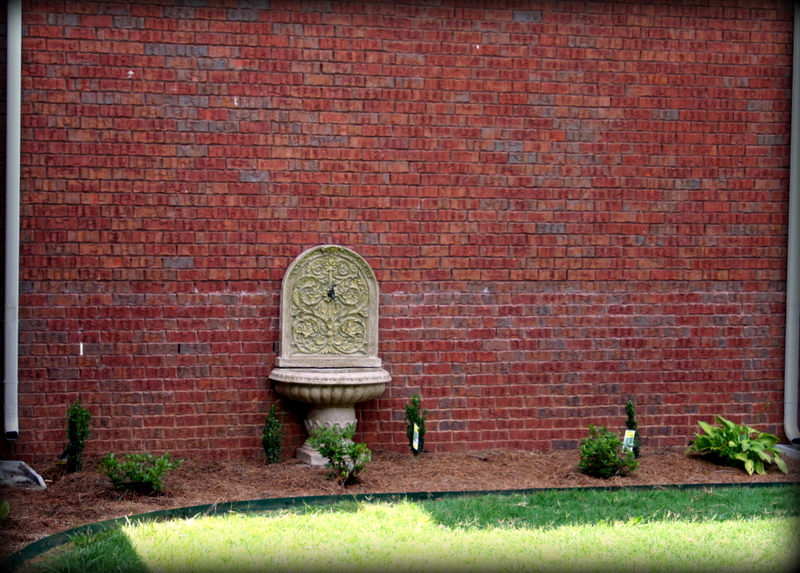 Yes, those smaller shrubs may look out of scale when you plant them. But unlike buying a too-small bedside table or too-tight shirt (both of which will always look and/or feel wrong), the plants will eventually fit the space. Refer back to point #1. If you need instant gratification, buy new cushions for your outdoor chairs. Plants need personal space. It’s tempting to cram plants in right to compensate for their current size, but consider what they will need when they reach maturity. The ‘Sky Pencil’ hollies will only get 18-24 inches in diameter, so we placed about a foot from the wall. The ‘Compacta’ hollies and azaleas will mound to about 3-4 feet in diameter, so we left ample room around them to accommodate their eventual size. Use fill-ins as needed. To keep the planting scheme from looking sparse, I tucked hostas in between the shrubs. They are shade-lovers and quick to forgive if I want or need to relocate them in a few years. 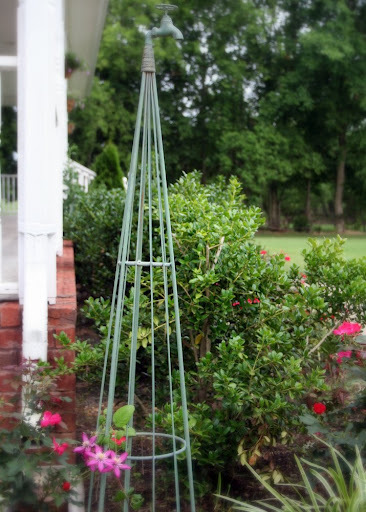 I’ll also add caladiums and impatiens for summer color, then plant tulips in the fall for spring color. Over time, the shrubs should fill in and each season I can evaluate how much – if any annual “filler” plants are needed and relocate any hostas that are no longer needed. For Garden Bloggers Bloom Day for May, here are some snapshots of the plants blooming in my garden today. My borders are brand-new, so I’m just glad to have a few plants that are already in bloom. Patience, grasshopper, patience. As fun as it is to peer at these fresh new blooms, I confess I’m actually more excited by the seedlings coming up and the promise of even more blooms over the next several months. 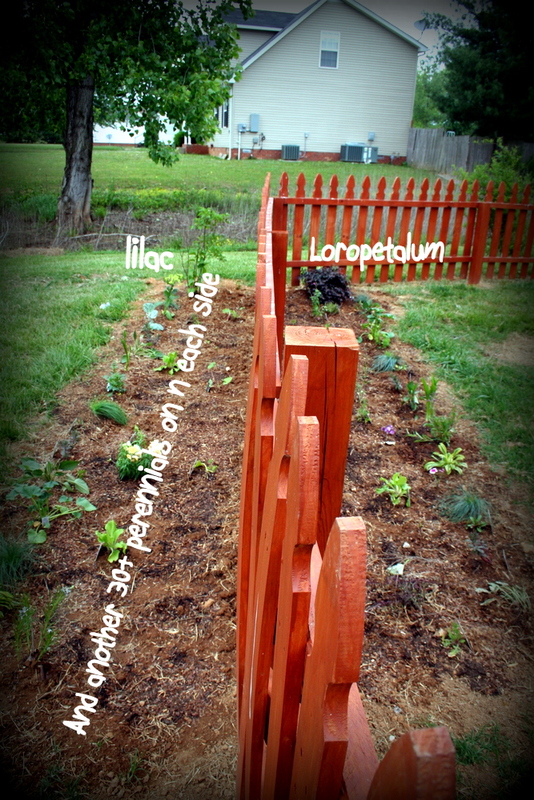 Since there are no crops to report yet, this is an update on landscaping and vegetable gardening, all rolled into one. (It was either that, or a short post with a picture that looked just like last week’s crop report. At least I think I know what you might be thinking, because I thought it, too. Something along the lines of, “Wow, all that work and all those plants, and it looks like that?” Yeah. Some days I wish gardening were like buying furniture. You go to the store, you find what you like, you have it delivered and that’s it; you’re done. But gardening doesn’t work that way – and these plants WILL fill in over the next few weeks and months. 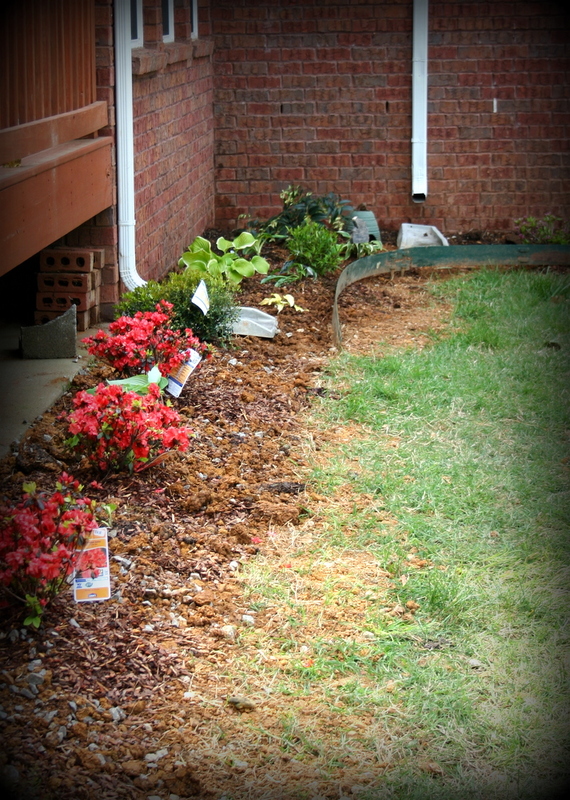 And in another week or so, the shots will show mulch and edging, which will make the beds look tidy and more cohesive. It’s a process. After all that, I went and bought more plants last Saturday (can we say glutton for punishment?) By then the weather had turned rather chilly and nasty and stayed that way for a few days. 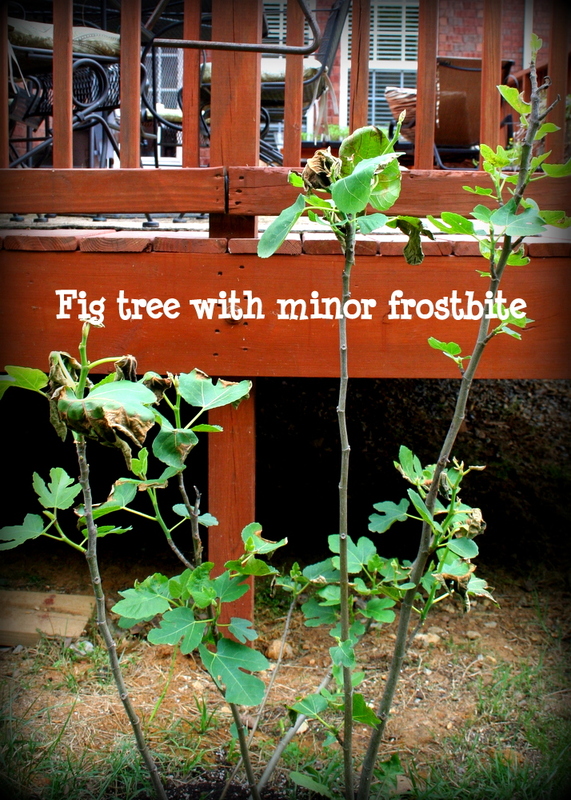 The fig tree sulked after the chilly nights. It was still recovering from the last nip of frost we got. But it’ll get over it; in fact, it’s already pushing out more leaves. Will we get figs this year? I’m not holding my breath. Midweek, it warmed up again and I got busy setting out the new plants. 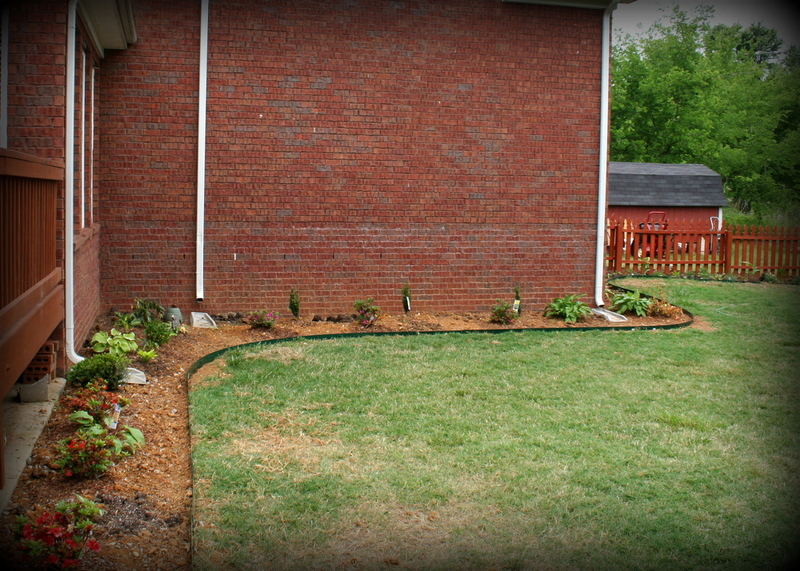 Here’s the new north-facing shade bed filled with Heucheras and Hostas. There are still a few bare spots, but never fear. More hostas will fill them up soon. I saw a tweet from Southbranch Nursery saying they just got in a new shipment of stuff. And I haven’t slipped over the Valley View and the Farmer’s Co-op garden centers yet. Now I can honestly say the majority of the vegetable garden IS in for the year: carrots and radishes are planted in between rows of sweet onions in one of the elevated beds. (Hopefully the loose, fertile soil conditions of that bed will help my odds of raising edible, good-tasting root crops this year.) 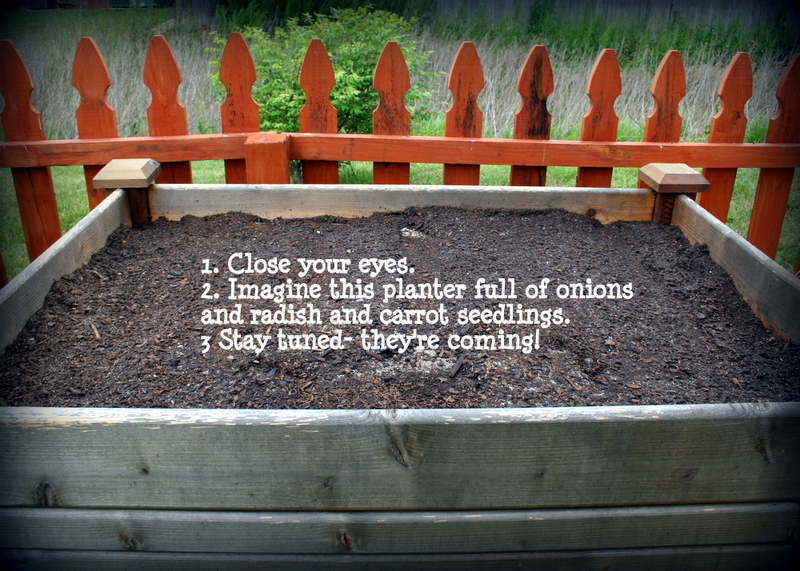 You have to use your imagination to see them, but I promise there are seeds and onion bulbs in there. The windy conditions mean almost constant misting to keep the new seeds and seedlings moist and growing; in fact I had to replant one pepper seedling that dried up and withered away before I could grab the hose and spray it. Hopefully I’ll have radishes showing up soon so I will have some real crops for the weekly show and tell. 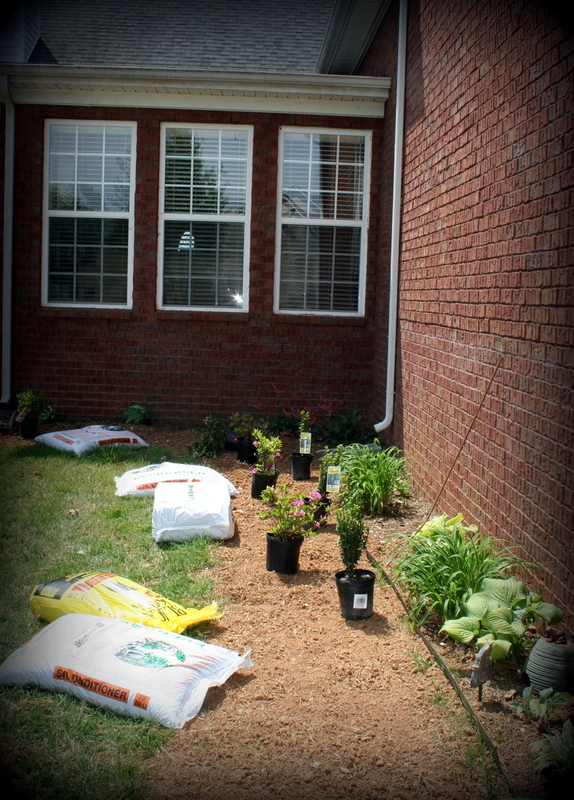 Two weeks ago, we (well, really Mr. Official) created new landscaping beds around our deck and along two sides of our garage, plus up and down the fence. I wasn’t sure exactly what I would do with all that space, but I could practically hear Mother Nature’s “biological clock” ticking like a time bomb. I knew it was only a matter of time before weeds sprouted and multiplied to fill all that fresh-turned dirt. So last Saturday morning, Mr. Official and I shuffled off to our local Lowe’s, mainly for soil amendments, but also to see if they had any decent looking shrubbery. 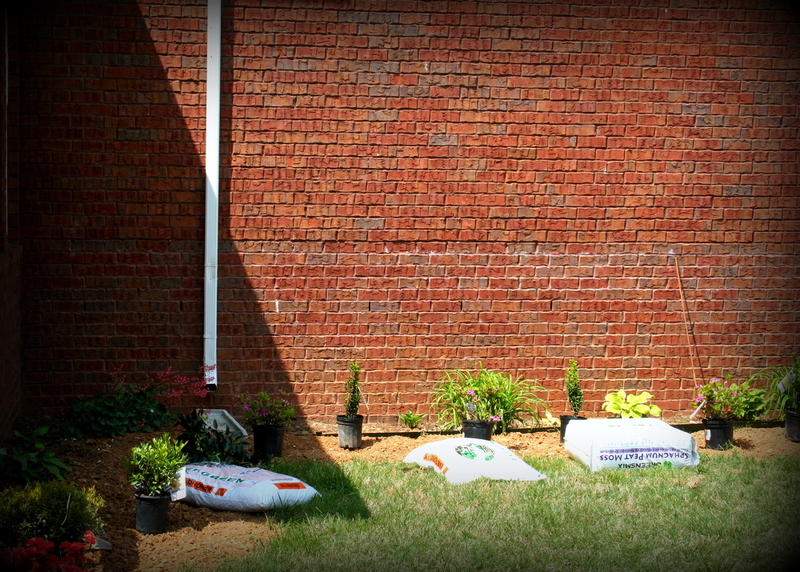 We came home with 6 bags of pine fines, 2 bags of cow manure, 6 azaleas, five hollies and a “hardy” gardenia (we’ll see if it lives up to its billing). And then we spent a few, mostly pleasant hours as follows. Step 1. We positioned the new plants where they would be planted, and strategically positioned all those bags of soil amendment around the perimeter. Step 2. 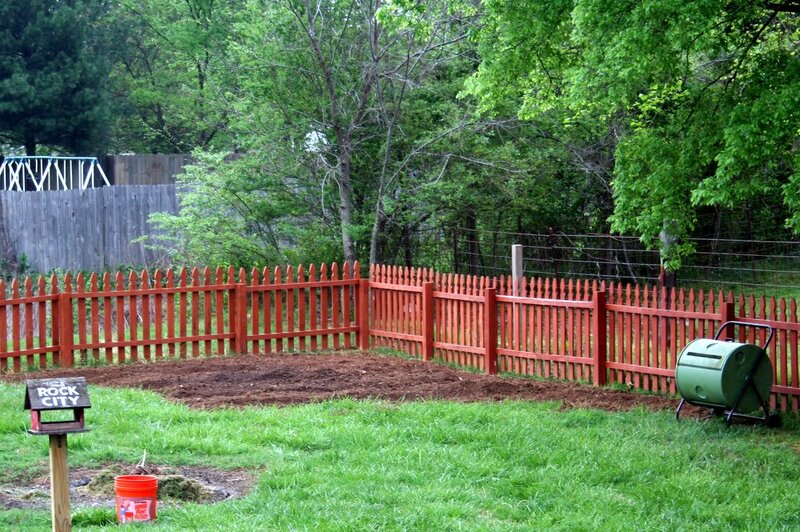 We dug each hole, amended it, added fertilizer, and planted everything. 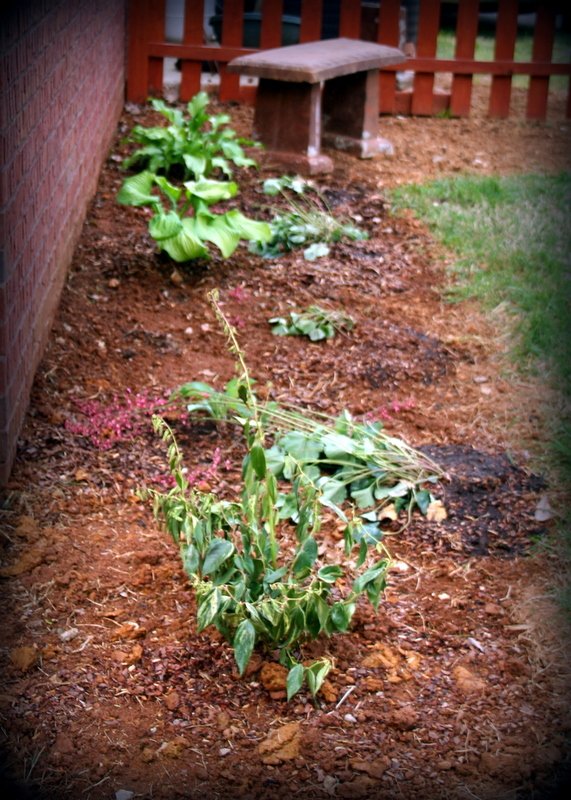 The existing hostas were dug up and tucked in between the shrubs. 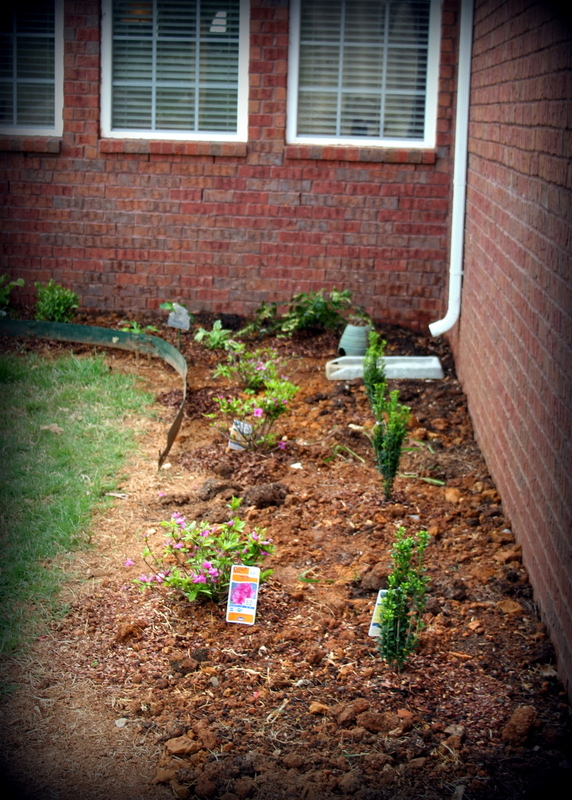 Some straggler daylilies and coral bells were also dug up for transplanting. Step 3. We installed the remaining hostas and the coral bells along the north-facing wall of the garage and water everything in. Yes, some of the plants in that last picture look a little bedraggled. Thanks for noticing. It’s a lesson I never seem to learn: I had purchased the Leucothoe shrubs a week ago (a reflexive response to Mother Nature’s tick-tock noise), and they really didn’t like being kept waiting. However, they’re fairly sturdy so I’m hoping this one will recover; ditto for the coral bells which I unceremoniously yanked out of their spot and transplanted. They just need to get over it. All-told we spent about 3 hours of serious work. Sure, we could have done more, but we both had other things we needed/wanted to do that day. I have learned – the hard way – that it’s better to dabble for a few hours and save something for the next go-round. 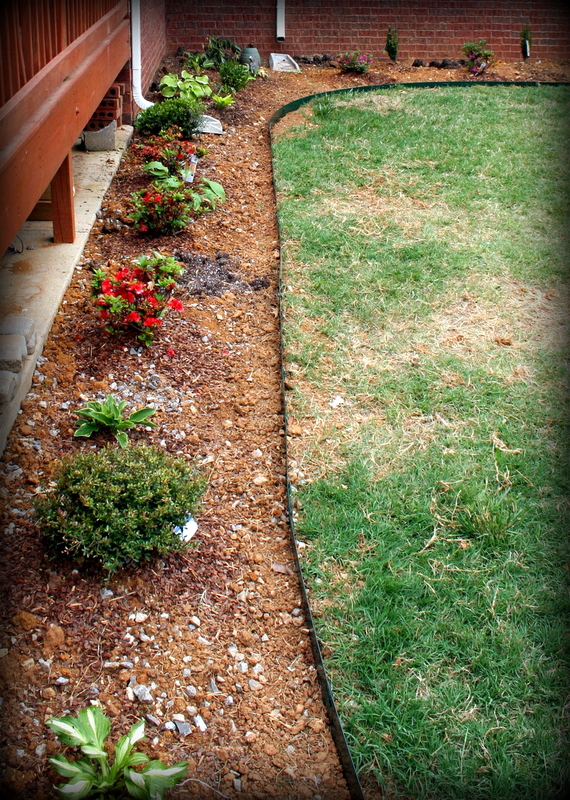 In this case, the edging is up next, then mulch. A dilettante’s dilemma: how much garden is enough? My husband, (Mr. Official to you, dear reader), is amazingly accommodating when it comes to gardening. He will dig or till up anything I ask him to. Before you think to yourself I am very lucky (I am), and wonder how you can clone him (you can’t), consider the danger that unlimited power can create. Like most gardeners, I have eyes bigger than my ability to maintain. Each spring, I scheme and dream up all sorts of flower beds and envision the most extraordinary, prolific garden seen outside of Eden. But we’re not in Eden, for reasons that go back a few thousand years. 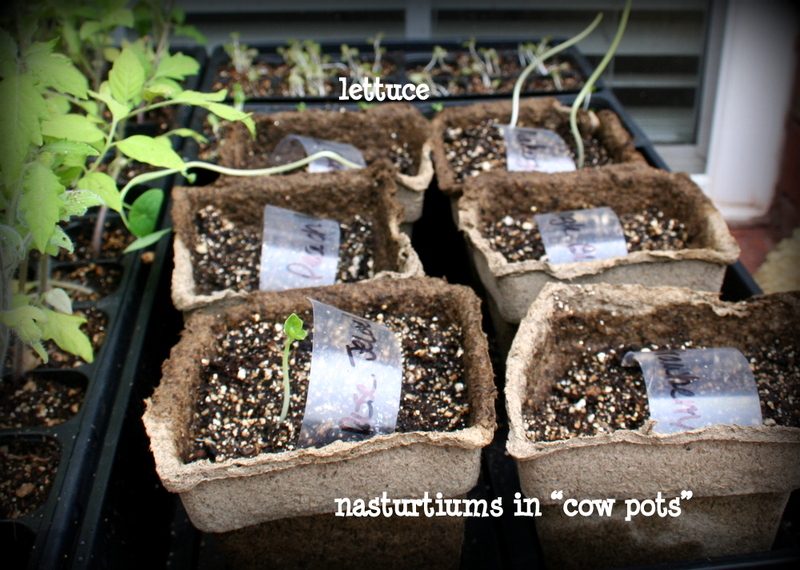 What we plant we must nurture: water, feed, mulch, weed. Repeatedly. Last year at this time, we were in the throes of closing in on our closing date and preparing to move into this house. Very little gardening happened in 2011; not in my head, not anywhere. I made it a point to minimize the gardening when we moved in, and that was a good thing. 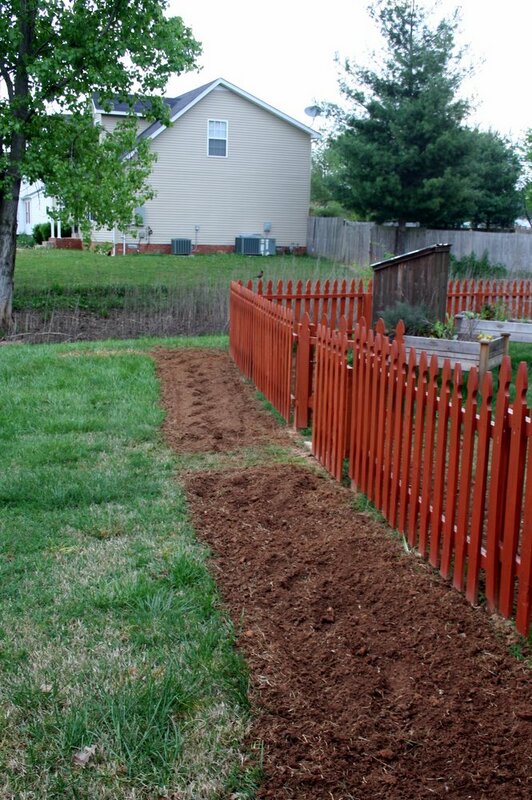 But this year, we’re ready to have a full-fledged kitchen garden and start creating some backyard landscaping, beyond the one puny bed we inherited when we moved in. And so yesterday the weather and calendar cooperated to bring us a relatively free and clear Saturday. With him on the business end of the tiller, the kitchen garden was soon ready. After a mercifully brief rain shower, he offered to till a swath in front of the deck while we still had the tiller. It’s a lot of bed to maintain, this I know. 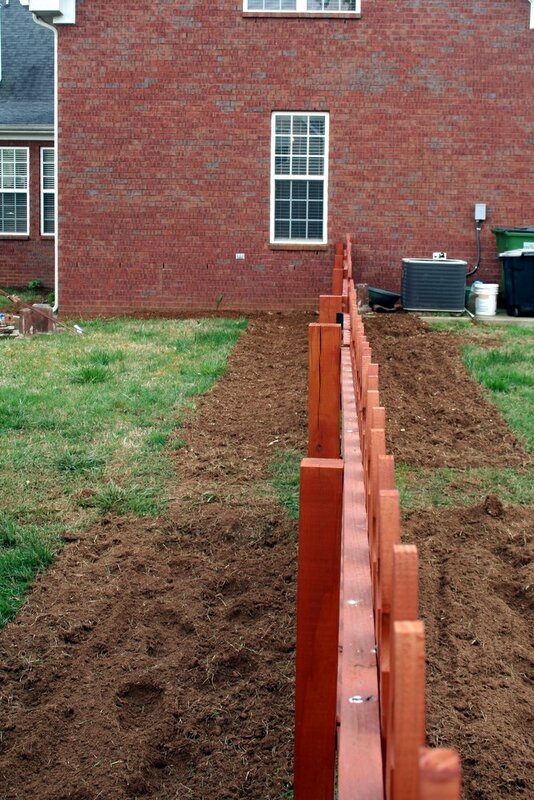 But for the beds along the side fence, I’ve already designed the planting scheme, and ordered plants. they are due to arrive in about 10 days. Admittedly, that does leave me quite a bit of unexpected new bed space (something like 60 linear feet, roughly 3-4 feet deep) to fill. And I need to fill it soon. Because nature doesn’t like voids. If I don’t fill it with something, she will. Even if I beat her to the punch, she has a way of leaving me surprises all summer long. So much for slowly increasing the landscaping year by year. 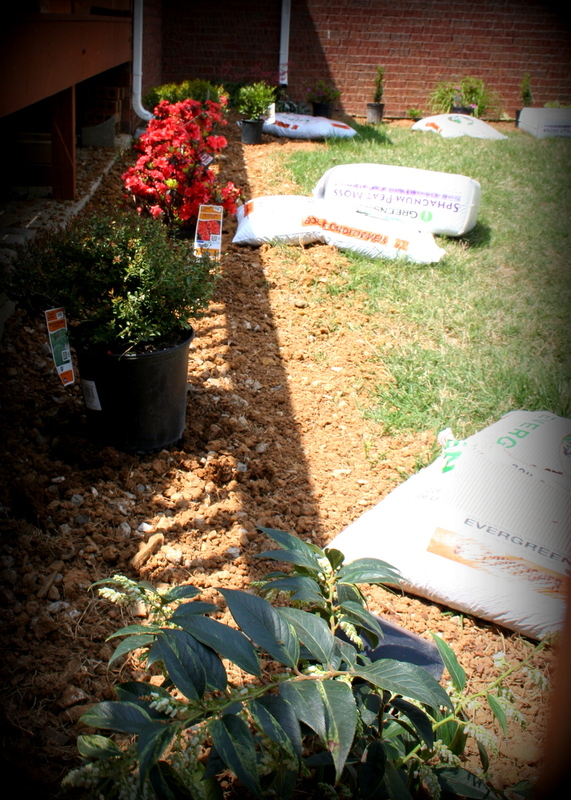 As we say around here, go big or go home – right after you go to the nursery and haggle for a volume discount. Moving into an existing house means inheriting more than a floorplan, paint and carpet colors. What happens when the last resident was a gardener and you inherit their plants and planting schemes? If you’re not a gardener, you probably don’t give the green stuff much thought – it either gets ignored until it turns into brown stuff, or it gets mulched or mowed down. If you are a gardener, it is a mystery to be solved. It can be as frustrating as teasing apart a knot, taxing your patience and persistence. As each new plant sprouts up, you peer closely; is it a weed to be yanked or a plant to be nurtured? What color will it bloom? Is it situated properly for its sun/shade and moisture requirements? Does it need to be fertilized or pruned or just left alone? Common wisdom says to let the garden have four seasons to unfold before you make radical changes. That gives everything time to make an appearance, and gives you time to decide if you like the landscaping, or if you want to overhaul or tweak it. When we first toured this house, it was December (our anniversary, to be precise). Not a good time of year to know what might by lying in dormancy in the garden. Throughout the spring, peonies, bearded irises and Shasta daisies have popped up and bloomed, and even snapdragons and morning glories have put in an appearance. Some hibiscus are ready to pop open, and I’m on pins and needles to see what color they’ll bloom. In the back yard, a few hostas and daylilies struggle in some tough-to-grow spots. I’ve moved the hostas to a shadier bed (out of the path of the lawnmower and weed whacker); the daylilies will get moved to a sunnier location along with some clumps of my faves I moved from our old house yesterday. I know I should wait until at least fall to plant anything. I know full well this is the worst time of year to plant, let alone transplant perennials – even with copious quantities of water, they will struggle with the incessant heatwave we call July and August around here. It’s hard (okay, impossible) for me to not scratch this gardening itch. The blank spot left by the dearly-departed clematis was so forlorn, right there as you rounded the corner of the walkway. I just had to fill it with something. Something like a tuteur…with a patina-ed spigot on top to keep it from seeming too high-falutin’. And a pretty new clematis (non-thuggish) to clamber up the structure. I’m pretty sure my fig and some other shrubs, the variegated vinca, native pachysandra and a few heucheras are going to find their way from old house to new house over the next week or so. And then I’ll just have to keep them tended until temperatures cool and the fall rains come. At least the toad house won’t require any nurturing. I may have to sort out squabbles among would-be tenants though. Inheriting a garden is a bit like the parable of the talents. There’s a balance to be struck somewhere between honoring the gift given to you and your desire to put your own imprint on everything. And of course, in this application, it IS prudent to bury everything – it’s the only way to get an increase.